"Merrily merrily merrily merrily life is but a dream!" The lovely thing for me in this movie beside the fairy tale and amazing plot twist was the way of conveying message. Starring the trifecta of life: death, love and time, you find your self immersed with emotions and thoughts about each and every one of the three. So lets got through each one individually and round all up at the end. What are you when you lose a loved one? How can life even go on? The movie title and message suggest you find the "collateral beauty" in everything even death which i believe to be too perfect to be true.but at least it also encourage you to accept death as a main part of life. for me i learnt to accept death 12 years ago after my mother passing away along with other painful lessons. Collateral beauty assures you life will hit freeze until you accept it. Until you embrace the fact that your most loved one like Olivia has passed away or more difficult in Simon's case accept your own death and try to build the remaining of your life based on the fact that you wont be here.Your family needs to prepare themselves to go on without you. And they are entitled to wave you goodbye and take their time doing it. So, Death is a crucial part of life and "nothing's ever really dead if you look at it right"
What is life without love? 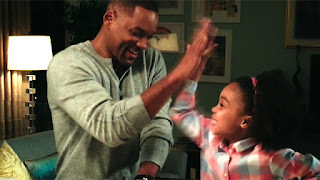 A lot lovey dovey movies asked this question before but the beauty in collateral beauty is raising the question though parenthood.What is love if you no longer feel the love of your own child.When a dad loses his daughter and finds out all the love he had for was useless to keep her around, then what is love?! What is love good for?! If a divorce takes your child's love for you out, how you react? How your life sounds? And how do you interact with your other loved ones? Love is in everything if you miss the love in your child's laugh you can feel it in your pain over her/him. That pain is pure love incarnated in the grieve. Love is in sickness and in health,in happiness and sadness. It's "the darkness and the light". So, "Love is the fabric of life, don't try to live with out love, please don't!" Time heals all, sometimes this statement is put to the test when times utterly stops. A major loss gets you to cling on the past and vanish any value times possesses. Time may be a a stubbornly persistent illusion as Einstein believed and the concept of time is only what we perceive to be. And It may be the linear base of everything in life and the only constant in the the universe. The undeniable fact is time is a gift and we are wasting it! Some people don't like this movie, actually a lot of them don't. The movie failed to earn its budget throughout US' movie theaters. Still I consider it a good movie! An amazing one if you are dealing with the loss of a loved one. And if you -hopefully- are not, Just make sure you notice the collateral beauty.